LA LA LALA LA LA, SING A HAPPY SONG! Here’s some long overdo Smurfs fanart. I wasn’t a diehard fan as a kid, but I did like it and watch it often when I was very small and remember it dearly. 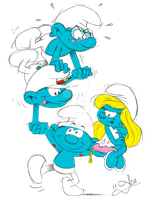 I’ve always really liked the art style of The Smurfs, and just always found their designs very fun and cool looking. Just super appealing, cute character design. Brainy was always my favorite Smurf, even if most of the Smurfs seemed to hate him in the old show, lol. Sure, he was egotistical and snotty, but I found him funny, and I felt his snobby ego was clearly a cover up for the poor dude’s insecurities. He had to hold his intellect above the other Smurfs to gain respect, and to be fair, it wasn’t very hard. Most Smurfs weren’t too bright. There were definitely other Smurfs who deserved more hate than Brainy. Greedy and Vanity for sure. I also remember having a little crush on Smurfette when I first watched it. I didn’t fully get crushes yet, as I was about 3, but I just liked looking at her, lol. And I’ve always liked her design. She’s just so cute and likable. I feel like her design is just one of those really fun, appealing designs that almost everybody has to love. But, anyway, I just watched Smurfs: The Lost Village yesterday. While there were some nitpicks here and there and I didn’t think it was amazing, it was surprisingly really cute and well made. I enjoyed it enough. I’d say it’s worth a watch, even if just for the beautiful visuals and animation. CAN YOU IDENTIFY ALL THE SMURFS SHOWN HERE? I kept ogling this image; I just saw the (ok) film not that long ago and since then my mind's been literally blue. You have a wonderful style, angled and for sure but somewhat whimsical..? Is that accurate to say? The smurfs in this picture: Smurfette, Papa Smurf, Brainy, Clumsy, Hefty and... Greedy? If we're going by the cartoon. Baker if we're going by the comics, probably. Anyway this is brilliant! Great stuff! You got all the Smurfs right, except the one you called Clumsy was meant to be Nosey, though that's really hard to tell. Ahhh, Nosy...! Absolutely loved him in the movie. It's the hat-over-the-eyes that made me think Clumsy, and I don't think that's a thing Nosy's hat has (correct me if I'm wrong) so if the hat was normal and his nose was more prominently displayed I might be able to guess it I see what you are going for there with having him more in the background and peeking his head around though... Classic Nosy! No, you're right, the hat flopping down is typically just a Clumsy thing, but I decided to use the hat as a substitute for eyebrows, making one half look frowning and the other raising, like he heard something interesting and wants to check it out. Ahh, makes sense! Thanks for explaining. By the way, you mentioned in your artist's comment that Vanity and Greedy deserve more hate than Brainy gets, and I understand why (Vanity's self-absorption and Greedy being, well, greedy) but actually, I think the reason why this isn't the case is because though they might have some not-so-good personality traits, Vanity and Greedy tend to keep to themselves. Vanity is just content to adore himself in the mirror... He'll brag about looking better than everyone else but not often (i.e. he keeps to himself mostly). As for Greedy, he might be always devouring food but he, in the majority of cases, actually makes the food he eats (at least in the cartoon). And he also cooks food for everyone in the village, thus helping the community. Not to mention that Greedy is actually pretty damn nice... He loves food but beyond that he doesn't necessarily match his namesake all that much. For YEARS I woke up to this cartoon before getting ready for school!!! Great job on everybody, especially on Gargamel... surrounded by Smurfs he can't catch to eat. Great work with all the characters! Gotta say love the way you drew Hefty, Brainy, and Smurfette (which were my favorites lol). 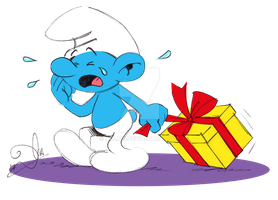 I didn't watch the Smurfs much but I always did enjoy the silly and cute characters. Funny coincidence seeing this pic. I've been thinking about getting the DVD collection for the cartoon at Walmart. (I saw a Heathcliff full set and I got it instantly.) Most 80's toons are pretty vague in my memory. I forgot the chef's name. 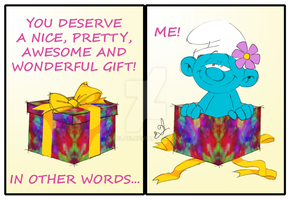 Vanity, Smurfette, Brainy, and Papa Smurf are the one's who I remember the most because of their names. I recall there was another old smurf who made a few rare appearances. Anyway, I like the style in which you drew them. That's awesome you got Heathcliff, because nobody has even aired repeats of his cartoon in forever. The chef Smurf was named Baker Smurf, and the other old Smurf, the one who wore yellow and had a long beard I believe was Grandpa Smurf. Ah, I kinda figured it was Grandpa Smurf and you're welcome! The new movie is pretty good. Definitely way better than the last two. I definitely enjoy it, when I see it tomorrow. Yeah, it's a really cute little show. Need more shading! It should look like it is coming from an edgy anime opening! Yeah, I wouldn't blame you finding the Smurfs tolerable as a kid. 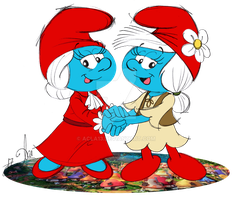 It's pretty lighthearted like allot of US distributed 80's cartoons where without being too blooming annoying at worse, and for Smurfette looking cute. I kinda had that feeling for Bubbles design from the Power Puff Girls as a naive autistic little kid despite seeing a few episodes on video tape since I didn't know cable existed. I never went into crush territory though, and yeah I can relate to Brainy a bit as well, but probably in a more subtle fashion. I rarely went full crush with characters, but many, like smurfette, I liked them a lot so in retrospect I just call it "a crush". As a kid I would have never called it that because I usually didn't even remember I liked the character until I saw her again. I am a big fan of these little blue bundles of joy. Nice work on this picture.